Revolution Four Directors Nik Ellis and Justine MacLaughlin will be Enterprise Advisors at Pensby High School Wirral. L-R John Rice(Asst Head), Nik Ellis, Justine MacLaughlin, Kevin Flanagan(Headteacher), Karen Rowles(Careers Advisor). 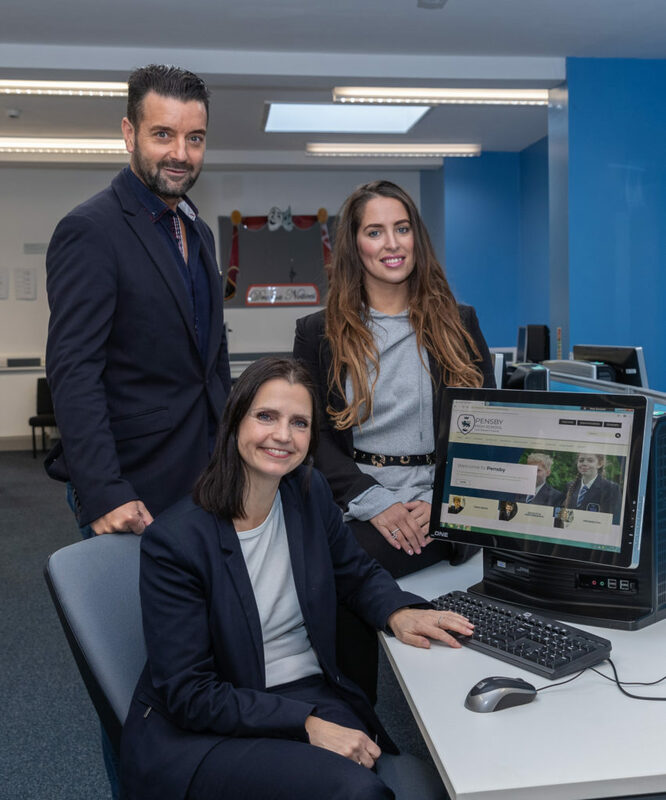 The Liverpool City Region Local Enterprise Partnership (LEP) has developed the Enterprise Adviser Network for the City Region, which is part funded by the Careers & Enterprise Company, to bridge the gap between education and employers with the use of volunteer advisers who visit schools and colleges. Currently 109 schools are engaged with over 80 Enterprise Advisers, representing a range of sectors across the City Region. The LEP also runs a Careers Hub that unites schools and colleges, with universities, training providers, employers and career professionals, to improve careers education. Revolution Four, led by Nik Ellis and Justine McLaughlin, will now work with Pensby High Schools’ senior leadership team to develop a whole school strategy for careers, enterprise and employer engagement. Welcoming the news, Sally Beevers, Careers Hub Lead for the City Region said: “ Young people are our future, so it is vitally important we inspire and support them to successfully enter the workplace and I’m delighted to welcome Nick and Justine to our team of Enterprise Advisors. The firm’s senior directors are linked to a number of other enterprises including the UK’s premier automotive expert witness service Laird Assessors, and Merseyside IT software firm Livepoint. Revolution Four Directors Nik Ellis and Justine MacLaughlin will be Enterprise Advisors at Pensby High School Wirral. Nik and Justine with Karen Rowles Careers Advisor. After many months of informal collaboration, we have now agreed an official partnership with Pensby High School,” said Nik. “We have seen huge potential with its intake of bright and enthusiastic students, and we are keen to take the partnership to the next level. Our team at Revolution Four feel passionately about mentoring future generations and sharing our broad business knowledge. Being an active part of our community and giving back are central to our ethos. This formal partnership presents a terrific opportunity to showcase how we can build a stronger bridge between academia and business within our community. Revolution Four has access to hundreds of professionals and entrepreneurs through our network of clients and contacts, who can speak from experience. Our mission is to ensure our students are as knowledgeable as possible about their options to enter the world of work, so they can make informed decisions to suit their individual aspirations. Youth unemployment is currently three times the national average for 16-24 year olds. Meanwhile, recent studies have shown that 66pc of businesses believe that work experience is critical for recruitment, yet only 38pc of business offer it. Justine said the firm’s recent rebrand relates to its four core areas of interest – creativity, design, technology and media. “Working within these industries we see how the working place is rapidly evolving,” she said. “We are already seeing a shift in the type of jobs available in the marketplace, moving away from more traditional roles. This will only become more pronounced in years to come with greater focus on automation, robotics and AI. The reality is many jobs will become obsolete in the next few decades, with some studies suggesting up to 800million jobs could be lost globally. This backdrop is directly connected to our grassroots work mentoring and guiding students at high school level. We feel the onus is on today’s working generation to educate younger students about where key opportunities lie in the future, including areas like STEM education programmes focusing on science and technology. In order to provide the best future for our local youngsters we need to direct them towards the brightest, most vibrant and sustainable careers. We have burgeoning tech centres across the North West in Liverpool and Manchester driving world-class innovation. It is not exclusive to the likes of Silicon Valley. However, we must educate and encourage our local talent to seize the opportunities which are here on the doorstep.